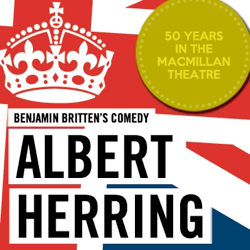 On March 4, 1964, the first opera to be performed in the new MacMillan Theatre was Benjamin Britten’s Albert Herring. On March 20, 2014, the University of Toronto Opera Division celebrated the fiftieth anniversary of the important occasion by remounting Britten’s much-loved comic opera. The new production is a great success. The stage director is Director Joel Ivany, a graduate of the Division’s own opera directing programme and Artistic Director of his own indie opera company Against the Grain Theatre. Ivany and designer Camellia Koo have clearly joined forces not to impose a concept but to tell Britten’s story as effectively as possible. Koo and Ivany have moved the period up from the 1900 of the libretto to the early 1960s. Koo has devised a splendid three-part set for the revolve of the MacMillan stage. The first third represents Lady Billows’ parlour, the second Mrs. Herring’s store and the third the marquee where the May Queen festivities are to be held. The first third is re-set while unseen to become a pub – a location only mentioned in the libretto. Each of the three sections is framed by metal girders with bulging rivets and the two street lamps outside the revolve are also made of girders. By this Koo seems to suggest the rigidity of the small village society and, with reference to the lamps, the constant vigilance the older generation imposes on the younger. Koo has allowed for there to be a corridor between each section that ends in a metal grille. Our first glimpse of Albert is of him holding onto the bars of this grille as if he were in prison – and, metaphorically so he is in such a repressive society. Ivany gives us our first view of Albert in his all-white May King costume also grasping onto the bars because now he is even more confined by the label of being the most virtuous and chaste young person in the village. Britten’s score has built-in music for transitions from one location to the next. Here the turning of the revolve is carefully timed to these musical passages. The one change is when Albert recounts his night’s adventures when the revolve rather than turning clockwise as it had, begins to turn counterclockwise showing us the pubs where Albert went drinking and returning to the marquee where Albert did “something worse” under the table with one of the girls. Rather than distracting from Albert’s tale, this close cooperation of direction and design only makes the story more vivid. In a student production one will always find voices at various stages of development. The most remarkable voice on March 20 was that of Iain MacNeil who played Sid, the worldly young man who urges Albert to let go of his mother’s apron strings. MacNeil, a natural actor, has a deep, rich bass-baritone surprising in someone so young and sense of complete ease on stage. Adanya Dunn displays a strong coloratura soprano in the role of the schoolteacher Miss Wordsworth, and she shows a great sense of comedy in the scene where her pupils practice the welcome song for Albert. Laurelle Froese has a fine bright mezzo-soprano as Florence Pike, Lady Billows’ faithful housekeeper and is also an excellent actor. Ivany has Pike begin the show by snatching a smoke from cigarettes hidden in one plant and a swig from a flask hidden another, business that Froese pulls off with great comic aplomb. As the Vicar Mr. Gedge, Ryan Downey, has a rounded baritone ideal for English art songs. Mezzo Melissa Peiou makes a fine impression as Sid’s girlfriend Nancy, who so regrets the trick she and Sid played of putting rum into Albert’s celebratory lemonade. As Lady Billows, Christina Bell wields a powerful soprano but as an actor is far too cheerful and unintimidating for the resident dragon of the village. She is not helped by Koo’s costume for her which should be a gown about two decades out of date rather than a tight contemporary dress. Jan Nato has a cultured light tenor as Albert and is a fine actor winning the audience’s sympathy both for his desire for a wilder life and for his exuberance in living it. Of special note is Opera Division alumna Sonya Gosse, who returns to create a beautifully sung portrayal of Albert’s mercenary mother, more interested in the £25 prize than in Albert himself. Vancouver conductor Leslie Dala makes the most of the punchy rhythms and tart harmonies of the piece along with emphasizing Britten’s comic musical allusions such as the love-potion theme from Tristan when Sid and Nancy spike Albert’s drink. His tempi were crisp but he could have slowed the communal Act 3 dirge “In the midst of life is death” to bring out its serious side as well as it comedy. This production of Albert Herring is a fine tribute to all the Opera Division has achieved. The cast above sings again on March 22. A completely different cast, save for Sonya Gosse, sings on March 21 and 23.